The ability to receive information and discern it is true is an invaluable skill in this age of deception. Insights or gut feelings can point us in one direction or another, but only an objective investigation has the power to produce a high-resolution determination of validity. If intuition and emotion are broad strokes, then analysis and contemplation are the razor's edge of a fine point pen, both of which combine to form an image within the mind. The artist must gain a clear picture of the thing he or she is rendering in mind before attempting to reproduce it in some material form. Similarly, if our task is to validate an idea, premise or notion, it too must be clearly observed. How can we hope to judge a thing on it's merits if we have not gained a complete picture of what it is? Although the term objectification has now become synonymous with intolerance and bigotry, it was once used to indicate a metaphysical process of data distillation. We can think of this as a type of mental alchemy, wherein, the prima materia of a suggested idea or belief is put through a process of purification. 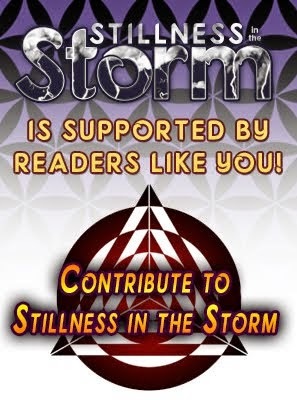 In this case, the writer is analyzing the work of secret space program insider and whistleblower Corey Goode, who claims to be in contact with highly advanced beings, as well as having spent over 20 years as an Intuitive Empath. Goode's claims are extraordinary, and as the old saying goes, extraordinary evidence is required to validate them. But in Goode's case we have no such evidence. As a result, many have chosen the seemingly easier path of dismissing everything he claims without investigation. But can we simply abandon claims that are not easy to validate? I think not. There were many extraordinary claims verbalized by individuals throughout history, and in many cases, it took hundreds of years to validate what was being said. Therefore to assert that any claim which cannot be validated immediately must be untrue is decidedly illogical and not a valid process of determining veracity. Herein lies the work we each have set before ourselves, to perform our due diligence as stated truth seekers and to reach beyond what feels comfortable by entertaining ideas when evidence is scarce. The following is an excellent example of how one can use objective processes to make a prediction or conclusion about a notion's plausibility. The key behind this is to honestly place all available evidence on the table and then draw a conclusion. The more evidence which is held in mind, the more likely a conclusion is to be accurate, but we must always remain objective, meaning, we must never mistake our conclusion to be absolute. Absolute conclusions require absolute knowledge or omniscience, and since our knowledge is ever increasing by way of experience, so does the accuracy with which these conclusions are drawn. The more we know, the better we become at discernment. The skills demonstrated in the article below can be used for all ideas, beliefs, and claims, which if applied personally in one's life, produce an internal stability and sureness of being that, once cultivated, can never be taken away. This is what I like to call intrinsic knowledge; it takes us beyond blind belief or acceptance. 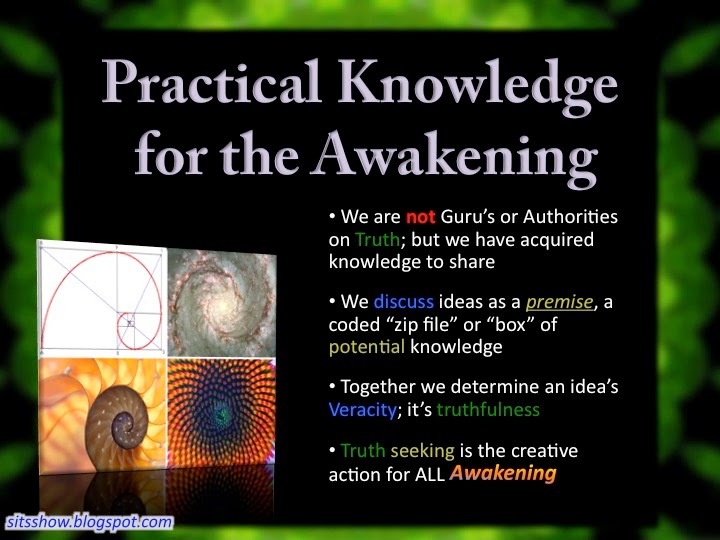 Intrinsic knowledge empowers consciousness to see the truth. 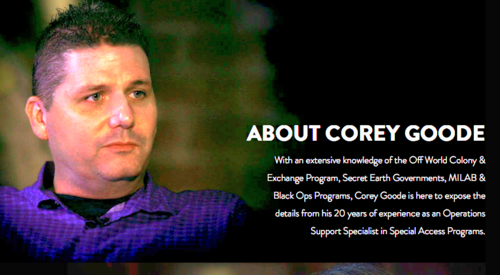 Corey Goode has shaken the Ufology community by making claims as a purported former Secret Space Program (SSP) operative. 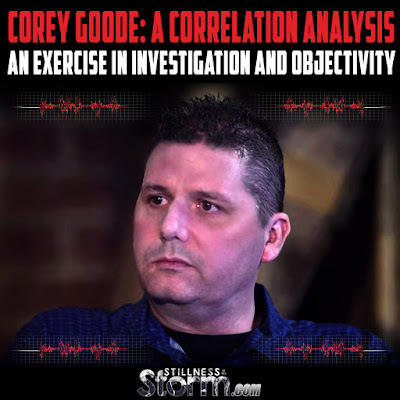 When assessing a new source of information, especially when firm background information on the source is unavailable as in Mr. Goode’s case, the first order of business is a correlation analysis. Corey Goode’s primary contact, David Wilcox, has done a good job of pointing out areas where Goode’s testimony is “in sync” with his other insider sources. But because those sources (of necessity) must remain unidentified, objective researchers must do their own correlation analysis based on whatever information is available. In this case, the correlation base will be entirely open source video. Even with that restriction, the results were more impressive than anticipated. If the reader hasn’t seen or heard Corey Goode speak, below is a 45-minute interview summarizing his testimony. When hearing the source’s own voice and reading the subtle clues of body language, every person has their own built-in “lie detector” that we use to protect ourselves from used car salesmen, politicians, and the occasional government disinformation agent. After watching Mr. Goode’s testimony, if he is a disinformation agent (which unfortunately must be retained as a possibility), he is certainly convincing. One of the first points of correlation I found with Mr. Goode’s account was with the interview securityexpert Bill Pawelec held to be released after his death in 2010. Mr. Pawelec is the notable inventor of the CIA tracking chip, which he devised after the kidnapping of several high-value American assets such as Brigadier General James Dozier in the 1980s. This directly pertains to Goode’s testimony with respect to the SSPs in that one of the jobs Goode claimed to have performed was working with an ET group to retrieve Earth humans taken offplanet as slave labor by one of the cabals. Goode claimed they were “tagged” somehow, which expedited their rescues. In the interview below, Pawelec at 10:00 talks about a secret government bureaucrat ordering 2 billion tracking microchips. It is a possibility that “at-risk” third world populations have been tagged during a SSP “vaccination program” of sorts, knowing some of them would be taken to the off world slave colonies Goode described. Pawelec also gives his views of the makeup of these Cabal power groups at 24:00. Goode says the SSP faction he worked with are sometimes referred to as Solar Warden and fly “outdated” cigar or cylinder spacecraft, in that they are over a decade old and other SSP factions have been updating their technology continuously. He says Solar Warden has been making increasingly close fly-bys of the ISS to pressure the secret Earth governments toward Disclosure. Here are two interesting videos that may record such flybys. One of the most interesting correlations is with respect to Goode’s testimony of an increasing number of “moon to Jupiter-sized” spheres reportedly entering the solar system to enforce a quarantine against meddling ET races. Here is an extremely clear video from NASA’s SOHO solar observatory of a Saturn-sized sphere connecting to the sun by some sort of coronal siphon, then rocketing off into space. As a space aficionado since childhood, the author can attest that this is NOT a coronal mass ejection, solar filament, or other natural phenomena. This is an extraordinary correlation, and probably the closest thing we will get to proof of Mr. Goode’s story. Goode said the first things the Sphere Beings did when they arrived was start bombarding the Earth with apparently harmless but intense pillars of light. These events made the international “bizarre news” in 2014. The first video is notable for being taken by a professional photographer and his testimony backed up by the flight crew and recounted to recognized international journalists. The next video shows a pillar of light briefly recorded from the ISS before the feed was cut, which is becoming something of a “stamp of authenticity” when unexpected astronomical events occur. The third video is a montage of photographs purporting to record the pillar of light phenomena from ground level. It should be noted that while some of the photos appear suspect, the majority do appear to record a real event. Goode says the “eggheads” in the SSPs were very perplexed by these “pillar of light” events, because the beams were not directed at human or ET underground bases, nor at the known Earth energy grid intersections. One conjectural possibility is that if underground bases are powered by building them at energy grid locations, it is possible the Sphere Beings are attempting to alter the energy grid to cut off the power to hostile ET and human bases. This could be compared yo the police cutting the power in a hostage situation to pressure negotiations. Goode said the next thing the Sphere Beings did was set up two energy barriers, one around Earth to prevent space or portal travel off world, and the other to prevent anyone inside the extended solar system from leaving and visa versa. Goode said a number of human Cabal types attempted to flee Earth despite being warned and their ships were disabled after impacting against the barrier. He also said these advanced Cabal ships consisted of a small passenger compartment that would be mated with several types of “flight modules” depending on the mission. “Flown into them” were the words he used. Or flown away from them like an escape pod in this case. This video is from January of 2015. Goode said that the most powerful Earth SSP faction is called Dark Fleet, which uses a mixture of advanced human and ET technology to conduct operations mostly outside of our solar system. Interestingly, Goode claims the blockade went into place right after most of the Dark Fleet left the solar system on a massed mission. He describes the Dark Fleet ships as “pumpkin seed” shaped. In May 2015, numerous residents of San Diego called the NBC affiliate to report a UFO over the Mission Hills area. The TV station sent a film crew who caught and recorded the truly extraordinary UFO video linked below. When shown the footage, Goode commented that yes, it appeared to be a Dark Fleet ship, but for it to appear uncloaked at low altitude it either wanted to be seen, or was a hologram. A great many naval officers live in Mission Hills, so if this UFO was indeed a Dark Fleet vessel or hologram thereof it could be theorized that this ship trapped inside the quarantine barrier may have been conducting a show of force for the Earthbound military officers below to unknown ends. A highly significant event Goode reported was an attack by Solar Warden on one of the other faction’s bases on Mars. Goode reported that the Sphere Beings were extremely displeased, saying there were over 100,000 human slaves on that base who were also killed. Interestingly, 30 minutes before the attack, NASA shut down the cameras on the Mars Orbiter. But the Indian Space Agency did not, and their Mars Orbiter took the photograph reported below. Solar Warden was reportedly told by the Sphere Beings to refrain from lethal force thereafter except to enforce the quarantine. This was another highly unusual event, which was immediately countered by the usual “government experts” with somewhat implausible “dust devil” explanations. Like the cutting of the ISS feed, when the government and the media (but I repeat myself) trot out the “Venus and swamp gas” experts to quash an inconvenient video, it serves as a signal flare of importance to the practiced observer. Goode says that Russian President Vladimir Putin is drawing a hard line against the European-centric Cabal and any ET visitors associated with them. This video showing a cube-shaped UFO shot down over St. Petersburg was taken less than a week after the El Paso video. Note the energy influence on the cube before it suddenly smokes and drops. This is highly characteristic of a laser-based weapon system. The reader can find several videos of similar unclassified laser weapons under test with a casual search. If this video is a fake, it was at least well researched. A frequently used axiom in correlation analysis is that a single correlation is nothing. A second correlation is coincidence. A third correlation is evidence. In spite of limiting the correlation base to open source material, several interesting correlations are revealed, many taking place after Mr. Goode’s statements and therefore clearly not a piecing together of unusual current events to bolster his story. Ryan Jones is an engineer and the author of the novels Datashark, Specters, and Final Security. He works in competitive research for a Fortune 500 company. Secret Space Program astronaut Corey Goode claims that U.S. military bases and colonies exist on Mars.